A key feature of HR software is allowing employees to request holidays online. HR managers can approve or reject requests, helping them identify patterns or potential problems within departments or teams. HR software helps to eliminate manual calculations via the automated tracking of accrued entitlement for employees across working patterns. In Empresa working patterns can be assigned to individual employees and entitlements are tracked according to when leave requests are made, approved and taken. 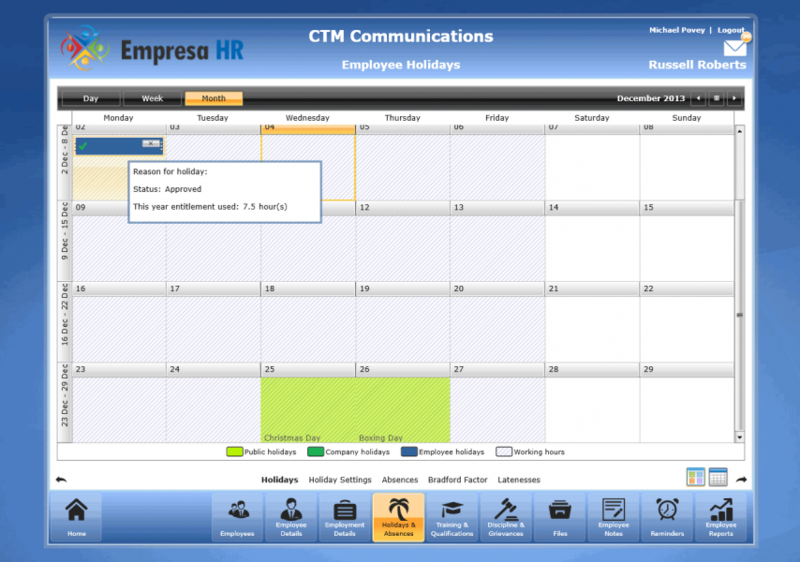 Empresa HRM software uses the Bradford Factor and central calendar to reduce costly staff absenteeism and identify disruptive absence patterns. Proactively identify those employees who disrupt your business through absences using HRM software. The Bradford Factor (Bradford Index) is a formula, devised by the University of Bradford, to take account of the disruptive effect of frequent short absences as well as long-term absence. The formula identifies an employee’s irregularity of attendance by combining measures of absence frequency and duration. These measures indicate whether the composition of an employee's absence record comprises a few, or many, spells of short or long term absences. The disruption caused by frequent short-term absences is often greater than that caused by occasional long-term absences. The Bradford Factor gives you a consistent and objective measure of the disruption caused by such absences and allows you to identify any employee whose absence pattern needs reviewing. The Bradford Factor scores are measured against configurable trigger values that you define in advance. If an employee passes that value, Empresa HR will notify you of the trigger value passed and of the appropriate action to take (as defined by you in advance).